Vertical lapped materials have long been recognised for their thermal and acoustic properties and the weight reduction possibilities they offer. However, the high initial investment required for production may have hampered experimentation. NIRI have made significant investment, with a new V-Lap machine installed at their Leeds-based facilities, to help grow potential markets and applications. The acoustic characteristics of vertical lapped materials - due to the unique vertical arrangement of the fibres within the fabric structure - lead to a high directional surface area, making them ideal for acoustical insulation. A low weight-to-bulk ratio means that vertically-lapped products are foam-like, giving a reduced weight / cost balance at comparable thickness, increased breathability, and greater resilience and compression recovery. Further, vertical lapped materials have high thermal performance (? ? 0,04 W/mK) and are recyclable and non-toxic. These properties make vertical lapped materials ideal for a range of sectors. In the automotive industry, they are already used by some of the world’s biggest names, including BMW, Ford, General Motors, Honda, Mitsubishi and Toyota. The combination of acoustic insulation, weight reduction and component uniformity has been successfully exploited for production of a range of automotive parts, including door insulators, headliner pads, under-carpet insulators, parcel shelves, bonnet protectors, dashboards, wheel arch liners and door components, where weight reduction can help with fuel efficiency. 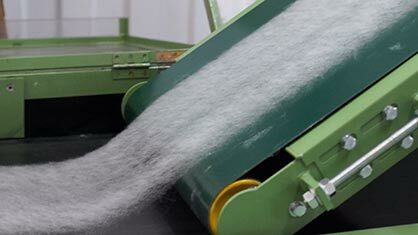 V-Lap, the company behind NIRI’s new equipment, advise that in filtration, the unique structure of vertically orientated webs improves coarse particle holding on the surface, as well as depth filtration of finer particles, resulting in a filter with very low pressure drop and high dust holding capacity. Applications include industrial processes such as abrasive blasting and metalworking, as well as water purification, waste water polishing and biochemical manufacturing. Within the medical and hygiene sectors, tests from 2017 evaluated the properties and efficacy of vertically lapped nonwoven fabric for hip protection pads. 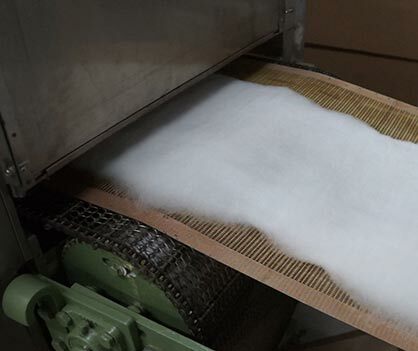 With a similar force attenuation capacity to closed-cell foam, the inter-fibre and voids in the nonwoven structures enabled moisture to escape into the environment, with a significantly higher ability to transfer moisture than closed-cell foam pads. As sectors where NIRI have extensive expertise, this is, clearly, an area where NIRI can help clients develop new and valuable applications. 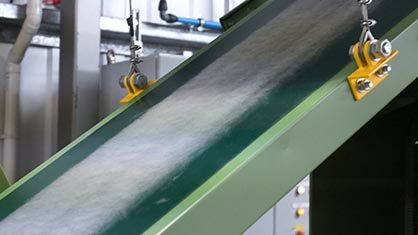 NIRI’s new V-Lap machine will also benefit clients interested in utilising waste fabrics from clothing and carpet waste, such as PET/PP, as the technology enables products to be recycled after their functional lifespan, then made into further materials, thus reducing the need for landfill. The VLS500 Sample Line Model now installed at NIRI is designed to patented VLAP specifications and allows for quick and easy changeover between products. At 400mm wide, it makes a trimmed product up to 300mm in width, between 20 and 42mm thick, and can accommodate virtually any manmade or natural fibre.